The PYRO Immersion Thermocouple Thermometer is a rugged portable easy to read thermocouple pyrometer that utilizes interchangeable and reusable immersion thermocouples. 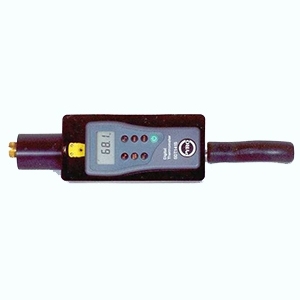 This analog pyrometer is ideal for temperature measurement using thermocouple thermometer K type thermocouples. Temperature measurement accuracy to ± 1.0% of reading is achieved by employing an automatic internal cold end junction compensator to prevent temperature measurement errors due to ambient temperature variations. The PYRO Immersion Thermocouple Thermometer temperature sensor comes complete with a rugged cast aluminum housing, integral extension arm and is ready to use with a wide variety of optional thermocouples. 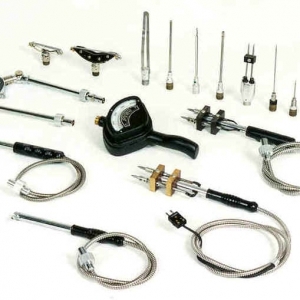 The PYRO Immersion Pyrometer can accommodate a wide variety of thermocouple tips that are suited for many types of non-ferrous molten metals.